I inserted a quarter into the small locker holding my wallet, keys, and cell phone. To enter the maximum-security prison, I would need only my ID, which the guards would keep at the front gate until I returned. I walked through the metal detector for the last time. Claire, my fellow TA, and Stuart Paul Duncan, the course instructor, followed. The prison guard leafed through Stuart’s music books to make sure nothing was hidden between the pages. It was our last day teaching music theory and appreciation at Auburn Correctional Facility, one of New York State’s largest all-male maximum-security prisons. A semester had flown by, and I felt a deep sadness at the thought of never seeing or hearing from my students again. The inmates had little means of communication with the rest of society. There was certainly no internet access, not even computers. And we were discouraged from writing them letters. At the Cornell Prison Education Program training sessions, program leaders warned us not to stay in touch with our students. You do not want an inmate to become attached to you and there should be no relationship or friendship beyond the classroom. It is not that I wanted to become friends with anyone, but the thought that my students would just fade back into anonymity disturbed me. After today, I would never know if a student went on to accomplish something, to continue his education, or even to be released from prison. I would never know if their lives or circumstances changed. They would disappear behind the prison walls, and I would go on with my life. I was also nervous. Every week, the inmates asked me when they would hear my music. Stuart promised that on the last class I would share my compositions. Claire had played for them one of her original folk songs, which they seemed to enjoy. She taught them the chorus and they clapped along. I was less sure of how they would react to my chamber music, even though they had spent the semester listening to 20th-century classical music and discussing compositional techniques. After a half-hour of walking past security gates, across the prison yard, past the rec hall, the make-shift weight room, and the license plate factory, we reached our empty classroom. We set up the desks and chairs while a guard brought us the prison’s boombox and electric keyboard. Our students arrived, escorted to class in single file. With enormous smiles, they entered the room one by one, as they always did, greeting the three of us individually and shaking our hands before sitting at their desks. Shane was visibly nervous. In addition to sharing my music, Stuart had promised that he would perform one of Shane’s compositions on the keyboard. This was not Shane’s idea. He was by far the brightest student in the class, but he was painfully shy. He shared his thoughts quietly and eloquently, garnering great respect among his peers. In a few short months, Shane had learned to notate his own melodies, achieving the goal he had set for himself at the beginning of the semester. 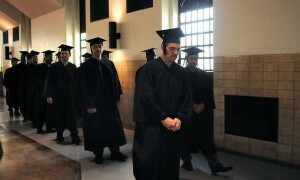 Shane was a leader in the class, a role that he never experienced in prison. It was known among the inmates and prison educators that Shane was gay. In his other classes, he wrote openly about his struggle to maintain his identity in the prison environment. Shane seemed perpetually downtrodden and timid, unlike some of his fellow students who were spirited and full of energy. Others were more subdued, some seemed angry, and a few had days during which they could not focus. In essence, our classroom was filled with students experiencing a full range of human emotions, just like any other classroom. Shane handed Stuart his composition, a ten-measure melody in C-sharp minor written for the piano. He looked absolutely terrified as Stuart performed the piece for the class on our little keyboard. The inmates were completely silent, listening with as much attention as they had given to Joseph Lin when he performed Bach’s Sonatas and Partitas for them earlier in the semester. They treated Shane with the same respect and it was clear that they were inspired. Shane’s composition had ascending triplets in the right hand and a slow chromatic descending bass pattern in the left. As the melody reached higher and higher, the bass moved downward. The harmonies were clear, the ideas consistent. I was very proud of him. When Stuart finished playing, the students burst into applause and Shane turned bright red. Next, Stuart met with each inmate individually to go over the final exams. He wanted to conduct another pedagogical experiment. What would happen if the students were asked to assign themselves a grade for the semester? Would an inmate’s self-assessment match the grade Stuart planned to give? “What happens if a student tries to convince you he deserves a better grade?” I asked Stuart on the drive to Auburn. As it turned out, all of the inmates assessed their grades accurately, with two notable exceptions. One man, who we knew had led a violent gang and possessed an intimidating demeanor, believed he deserved a B-plus when he really achieved a C. The second was Shane, who felt he deserved a C-minus even though he received an A-plus. After the meetings, it was time for me to play my music. I had printed out scores for each of the students. My piece was called He Disappeared into Complete Silence, named after a set of nine parables and engravings by the artist Louise Bourgeois. The parables were short, quirky, dark poems that accompanied Bourgeois’s stark, semi-abstract line drawings. As the title suggests, the poems dealt with the extremes of loneliness and the inability to communicate. I realized as I distributed the scores that I had included my full name as the composer. I was supposed to protect my own privacy. “Can we keep these?” Gherald asked. “Yes,” I replied instinctively. Gherald began flipping through the images and penciling in his own drawings alongside Bourgeois’s illustrations. In my setting, the soprano repeated the word “party” several times, finally arriving on a high C while the wind players put down their instruments in favor of party blowers sounding in unison. How could I possibly think, when I composed this piece as an undergraduate student at Cornell, that these words would be heard by men who had committed murder? I knew from reading articles online that one of my students had, in fact, cut up the body of his victim. “I didn’t write the words!” I cried hastily. Gherald laughed. “Oh O.K., we’re cool,” he said. “I was worried about you for a second there.” I would like to note that Gherald, along with about half of my students, was not incarcerated for murder. While the inmates listened to my music, I felt more uncomfortable than I had during my entire time teaching in prison. I felt exposed, not because they knew my full name or because I was a woman wearing oversized clothing in order to hide my form. There was no hiding behind my music. I wanted to teach at Auburn because I wanted to know if and how contemporary classical music could be accessible to an outcast population who had never been exposed to it before. My students had proven to me that they could appreciate a wide variety of music. They could read themselves into a myriad of compositions, ranging in style, cultural origin, and time period. It did not matter how distant a piece seemed to be from their daily lives; they could engage emotionally and intellectually. Would my music make the same connection? Would it engage them, move them, compel them to share their experiences? Would they see themselves reflected in my work? Was my music strong enough to outstrip my own identity and reach others whose experiences were vastly different from my own? There was silence. Then Gherald spoke. His voice was calm. I was stunned. No one had ever said this to me, or at least not in this way. Gherald’s advice was so simple to understand yet so difficult to follow: write the music that you love. It took hearing it from a man who lives in prison—who has to work every day to find a sense of peace and happiness in a cold, dehumanized environment—for me to really understand. Gherald taught me that passion for the creative process, dedication to one’s craft, and a yearning to communicate is what makes an artist. To write from a place of love is to have a vision, to imagine a reality and bring that world to life. It means quieting the voices in your head, voices of doubt, distractions, even the voices of other composers. It means concentrating on one idea, focusing, yearning, inventing, analyzing. The act of artistic creation is a form of unconditional love. It requires complete devotion in spite of its flaws. You must believe in your own work to the point that you are compelled to create it and need to convince others of its existence. Even if it seems that no one is listening, you have to keep going. I think Gherald understood this. From what I saw of Gherald, I believe that he had come to terms with his own imprisonment. He had about him an air of serenity and deep spirituality. His eyes were always wide and full of life. He was powerfully built but possessed a gentle demeanor. He was not the best student, but I knew he was intelligent. What struck me most was that Gherald seemed the most capable of living freely in the midst of incarceration. He seemed free. Perhaps Gherald had a vision too, a vision of his world and his place in it, that put him at ease. All of my students touched me in a way that I will never forget. Even if I did not mention everyone’s names, each individual made a significant impact on me. I know that Stuart and Claire were changed, too. Since our experience together at Auburn Correctional Facility, Stuart has dedicated himself to researching education systems in prison. As a doctoral student at Yale, Stuart co-authored “Who needs music? Toward an Overview of Music Programs in U.S. Juvenile Facilities,” “Expressing the Self: Critical Reflections on Choral Singing and Human Rights in Prison,” and a forthcoming book with Mary Cohen entitled Behind Different Walls: Restorative and Transformative Justice and Their Relationship to Music Education. For Claire, teaching at Auburn Correctional Facility affirmed the power of education. Claire now teaches at a public elementary school in Los Angeles. In our class, Claire helped the inmates with the least educational experience. She imagines that they struggled to learn as children and did not advance far in their schooling. These men reminded Claire of the importance of primary education, of starting children off on the right footing. Her strongest memory of Auburn is when Gherald told her that she would make a great teacher and that she should pursue her dreams. When I asked Stuart what impacted him the most, he recalled his last conversation with Shane, shortly after performing Shane’s composition for the class. Shane told Stuart: “For the first time in my life, I feel like a human being.” Hearing his music, his internal melodies, sound through the classroom and shared with his colleagues, made Shane feel heard and understood. Saying goodbye was hard, even though the inmates all smiled at us as we collected the books. I noticed that Gherald had written on the first page of my composition, which had the printed title He Disappeared into Complete Silence. Around the word “He,” Gherald had scrawled a “T” and a “y” so that the title now read They Disappeared into Complete Silence. I looked at him, and my sadness must have shown on my face. In times of doubt, I return to Gherald’s advice again and again. He has no idea how much his words have stayed with me. I try to remember that all I can do is strive to express myself through my work, to trust my artistic and human instincts, and to believe that if I dig deep and share my interior world that it will reflect the worlds of others. Our lives are not so different. Art frees us from the chains of our individual identities and connects us to something greater—our shared humanity.